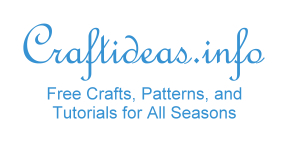 These are really fun and easy to make and look great no matter which color you choose to make them. A 5 mm seam allowance is already included in the measurements and should be used for all the sewing of this project, unless otherwise indicated. If you don’t like you stocking to be padded, you can omit the batting. 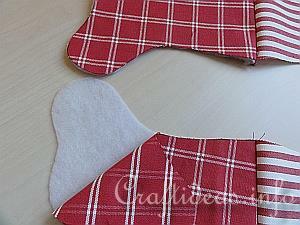 Stocking and Mitten Template - Both get sewn the same way; just the shape is different. 1. 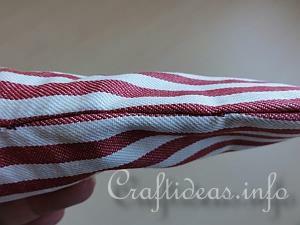 Pin your lining fabric with the wrong side onto the batting. 2. Pin now the outer fabric with the right side facing the right side of the lining fabric. 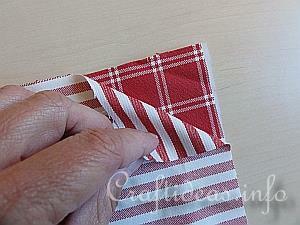 Do the same with the second fabric. 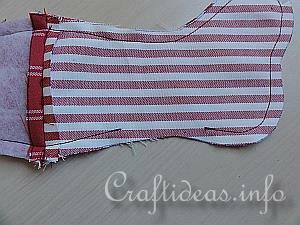 You now have two fabric “sandwiches” consisiting of an outer fabric, a batting layer and a lining fabric. 3. 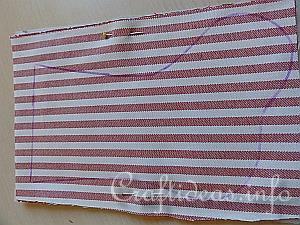 Trace your template onto the first fabric sandwich using the trick marker. Now cut out the stocking shape and pin the stocking pieces together. Sew across the top line of the stocking. This is important. 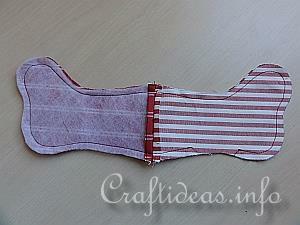 For the second fabric sandwich flip the stocking template over so the stocking toe faces in the other direction. 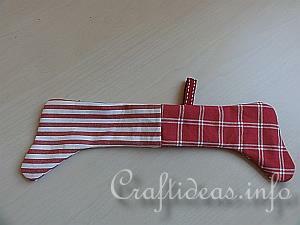 Trace the stocking shape, cut out and pin. Sew also across the top line of the stocking. 4. Now you have two stocking halves. 5. The batting remains under the lining fabric. 6. 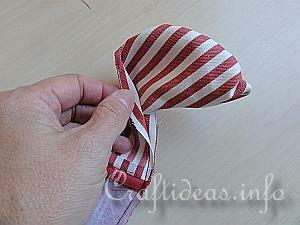 Before you sew the two stocking pieces together, insert a ribbon loop about 1-2 centimeters from the sewing seam. This will be the hanging loop afterwards. 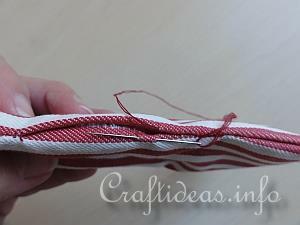 Pin this ribbon piece in place so that the loop end is inside the stocking and the ends are hanging a little over the edge. 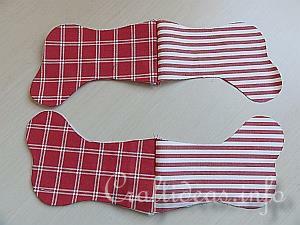 Now place the two stocking halves over each other with the right sides facing and pin in place. 8. 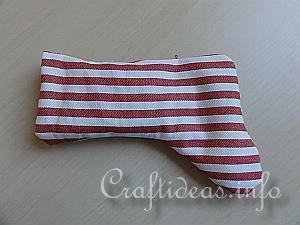 ...make the opening in the stocking side without the lining for easier hand stitching later. If necessary, you may wish to trim back the seam allowance before turning. 9. 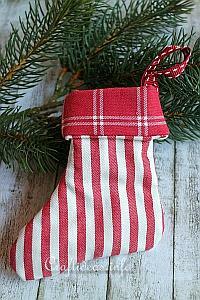 Now gently pull the inside of the stocking out through the opening. 10. Now your stocking looks like this. Iron it flat. The hanging loop can also be seen. 11. 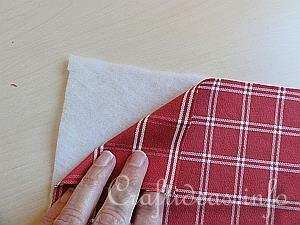 Then tuck the lining inside the outer fabric. 12. Hand stitch the stocking side closed (the opening needed for turning) with a slip stitch so that the stitches cannot be seen afterwards. 13. Now the opening cannot be seen. 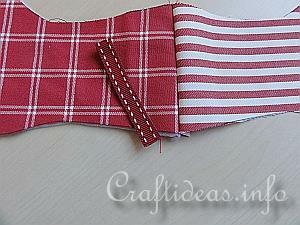 Turn a cuff down so that the ribbon loop for hanging is at the top and it is ready for use.